At H & H Lawn & Landscape, we know that you have made a big investment in your Omaha property’s landscape. Therefore, it only makes sense that you would want to use it as much as you can. A beautifully lit deck, patio or other landscaping feature allows you to fully enjoy your landscape at any time of the day or night. Properly lighting your landscape is a great way to add to your home’s entertainment value. In addition, a well lit landscape makes your Omaha home far more safe and secure. Guests and family members will marvel at the change landscape lighting can make. Lighting provides safe access near paths, drives and entry areas. Outdoor lighting increases security by discouraging potential intruders. The beauty of garden and home can be dramatically enhanced by showcasing architectural and plant features with dramatic lighting techniques. Unique lighting design makes your home stand out in your neighborhood. Properly designed lighting expands your outdoor entertaining options. If you want an outdoor lighting system specifically tailored for your Omaha residence, you will get just that. We will install a high quality, high performance landscape lighting system using the best landscaping supplies, so your system is built to last. Over time your investment in a quality H & H Lawn & Landscape lighting system will prove to be a great value. Enjoy minimal maintenance with a durable, energy efficient and trouble-free system that adds value and equity to your Omaha property. 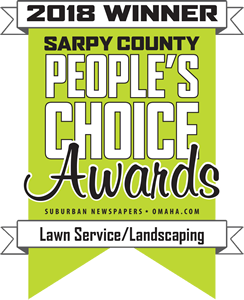 Call us at (402) 916-9500 to schedule an appointment for a free landscape consultation. We will listen to your ideas, wants and desires and incorporate feature lighting into your landscape design.